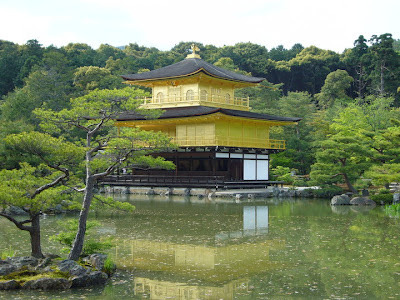 Kinkakuji is located in Kyoto which used to be the imperial capital of Japan for over 1,000 years. The temple was the retirement villa of the shogun Ashikaga Yoshimitsu (1358-1409), and after his death it became Zen temple. The temple is one of the UNESCO World Heritage Site Historic Monuments of Ancient Kyoto. I've been to Kinkakuji several times and love it especially in autumn with the beautiful maple leaves. Last time when I visited there was in early May in 2010, and this picture was taken at that time. Now I just noticed that the colour of the roofs are different from those in the postcard. Maybe they had some restorations of the temple. 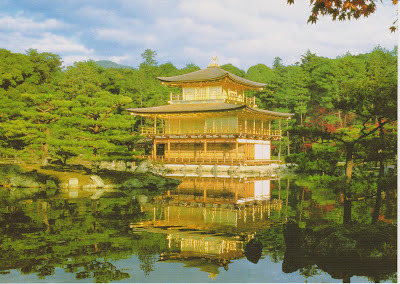 The day I visited there was a bit hot, but when I walked into the temple and saw Kinkakuji standing by the pond surrounded by the beautiful nature, I felt it was cool as if the temperature dropped 2-3 degrees. It was a nice calm atmosphere. :) I've never been there in winter time, so next time I'd love to visit there in winter to see the temple covered with snow! Thanks. :) Hope she will!